Learn more about the Lorex 2K IP Camera Home Security System. Find pricing, and answers to common questions. The Lorex 2K IP Camera Home Security System comes with an 8-channel NR900 network video recorder (NVR) and two vandal-proof dome IP cameras. 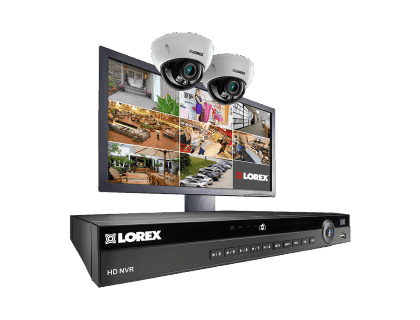 This Lorex security system comes with a 19-inch Energy Star-certified LED monitor as well. Two 2K dome cameras + 19" led monitor. 140 ft. night vision range. Pros: Up to six more IP cameras can be added to this system. Cameras suitable for indoor and outdoor use. Bottomline: This security camera system can expand as your business grows. What are some alternatives to the Lorex 2K IP Camera Home Security System? Where can I buy the Lorex 2K IP Camera Home Security System? The Lorex 2K IP Camera Home Security System is available via Amazon and the Lorex website. Does the Lorex 2K IP Camera Home Security System work at night? Yes. It features LND3374SB dome security cameras with a night vision range of up to 140 feet in ambient lighting, and of up to 90 feet in total darkness. Its automatic infrared cut filter ensures colors are captured naturally during the day, and black-and-white images at night are detailed. This system's cameras have a DNR (Digital Noise Reduction) feature that removes excessive grain in low light, which provides improved sharpness, clarity, and motion detection. Can the Lorex 2K IP Camera Home Security System be used in any weather? The Lorex 2K IP Camera Home Security System comes with IP66-rated security cameras that can withstand any weather. This system's cameras can operate in extreme temperatures from -22°F to 140°F.